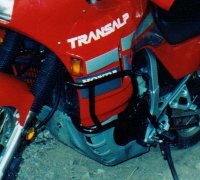 Few companies make aftermarket parts for the Honda Transalp. Luckily, Givi is among the few that do. Based in Italy, they sell luggage, windscreens, engine guards and other accessories to the European market, where Honda still markets the Transalp. 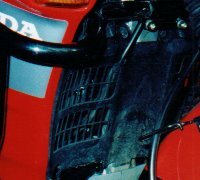 When you consider the cost of replacing the plastic side fairings, engine guards are cheap insurance. 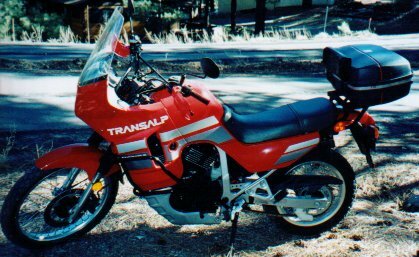 Givi makes the model TN363 engine guards for 1994 and later Transalps, but they will fit older models like the 1989 and 1990 versions with only slight modifications to the bike. Just as a side note, make sure you refer to them as "engine guards" when talking to a spouse, significant other, insurance agent or anyone else who might react negatively to the term "crash bars." My thanks go to "Eddie" of the Transalp mailing list, who originally described this procedure. Also, thanks to Arizona Motor Sports who handled my Givi special orders so quickly and courteously. Look at all the parts that Givi sent you. They include a sheet with a parts list and an exploded view of where they all go. Look closely at the bottom bolt (see photo). Givi provides an 8 mm x 110 mm replacement bolt that's too short for the older Transalps. As a matter of fact, it's even shorter than the stock bolt. You'll want something more on the order of 130 mm long. If you live in a metrically-challenged area, use a 5/16 x 5 inch bolt and nut. You can still fit a 13 mm wrench on it. Mount the U-bracket loosely to get a feel for how things fit. You may have trouble routing the clutch cable. I ran mine underneath the bracket, which has about a half an inch of clearance. So far, I haven't had any problems with the cable binding or pinching. Trim the indicated areas on the plastic radiator shroud to allow the bars to clear them. There are two indented areas that are just the right size to cut out. Cut up from the bottom about an inch until you reach the ridge across the top of the indentation. Tin snips work well for this part, and you can smooth things out later with a Dremel if you like. 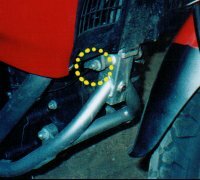 The bars mount at three points: the U-bracket, the lower bolt, and the footpeg bolts. Pull out the original bottom bolt, and mount the bars at that point using the longer replacement bolt. Clamp the top of the bars into the U-bracket. You'll want them snug, but you may need a bit of play when you fasten the footpeg bolts. 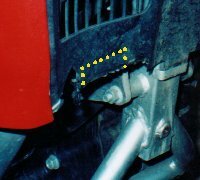 Remove the 14 mm footpeg bolt from the left side, and flex the left side engine guard until it lines up with the hole. Insert the bolt and tighten it down. This is the easy side. 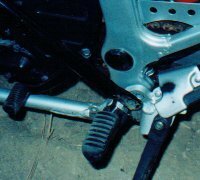 Remove the 17 mm footpeg bolt from the right side. This is a bit more difficult, because it also holds the footbrake. You'll notice some spring tension when you take it out. 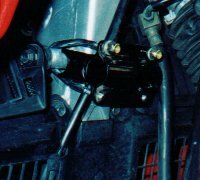 If you back off the rear brake adjuster it will makes things easier to install. Take a deep breath, flex the right engine guard, rotate the footpeg forward, and try to line up everything so you can get the bolt back in. Curse as needed. Tighten everything down. Get the footpeg bolts, the U-bracket and the bottom bolt. Readjust the back brake if you loosened it. Stand back and admire your handiwork. I hope you never have to try them out.